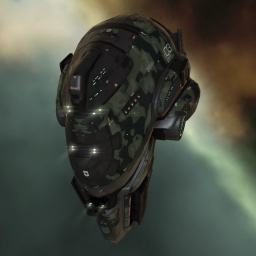 The Vexor Navy-Issued cruiser was originally designed to carry advanced on-board technologies requiring a great deal of skill to operate, but at the last moment the Federation Navy decided to scrap the more complex designs in favor of simple upgrades to the standard Vexor's armor, shields, hull and drone bandwidth. The result: a monster of a combat cruiser. The Vexor Navy Issue is the best cruiser-size drone platform out there, save perhaps for the Gila. Compared to the Vexor, the bandwidth has been increased from 75 to 125 Mbit/s and the drone bay from 125 to 200 m3 while the medium hybrid turret damage bonus has been replaced by a drone speed bonus. This allows the Vexor Navy Issue to carry and fly a full set of small, medium and large drones. With good drone skills this ship can out damage many of its rivals, using large drones against large targets, and small drones against frigates. The main problem, especially against small ships, is the danger of getting your drones picked off one after the other. Consider using a tracking disruptor with a tracking speed script to minimize this risk. Also, if the targets are expected to be far, consider replacing the large drones by Sentry Drones. Further information about additional or recommended skills to pilot Vexor Navy Issue for a specific or it's common role(s) can be written here. No sub-article about Vexor Navy Issue roles or piloting tactics. You can write them here. You can write additional notes for Vexor Navy Issue here. This page has been accessed 239,798 times.